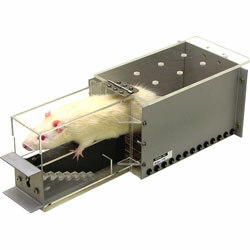 The staircase apparatus provides a simple, efficient and easy way to quantify the testing of skilled paw reaching for both the rat and the mouse (see Model 80301). Two food pellets are placed onto each step of two staircases located one on either side of a central platform (two widths supplied). The animals are placed in a box relevant to their size and can reach down either side of the platform to grasp, lift, and retrieve food pellets from the steps of the staircase. The numbers of pellets removed provides a quantifiable measure of the distance and efficiency of reaching skill. The design allows separate measurements of reaching capacity with the left and right paws, and does not require any constraint or restriction of the contralateral limb to measure performance on the two sides separately. The test is sensitive to unilateral lesions of the striatum, forebrain dopamine systems, sensorimotor cortex, as well as focal ischaemia. The specifications of our Staircase have been determined through extensive trials. These specifications are set to ensure good reaching and grasping motion and to minimize the spillage of pellets. These specifications affect the stair height and the size and depth of the well, which is critical to the efficacy of the test. The Staircase dimensions were based on a rat model of 150 grams to 250 grams to ensure the animal cannot turn around once it has entered the test area; however, larger animals up to 450 grams have been tested regularly. The overall dimensions of the unit are 360mm x 120mm (14 x 4.75 inches). Animals must make a coordinated reach and grasp to retrieve a pellet. They cannot simply scoop up pellets, which can confound the interpretation of results when measuring reaching into tubes. The numbers of pellets removed and the number of pellets knocked down to lower steps provide separate measures of how far the animal can reach, and from how far it can make a coordinated reach, grasp, and retrieval of the pellet. For example, striatal lesions have less effect on the actual distance of reaching than on the ability to make a skilled grasp and retrieval. This test provides an objective quantification of reaching, measured simply in terms of numbers of pellets displaced and retrieved. It does not require observer ratings of numbers of reaching attempts, success, or efficiency. The staircase test has been adopted by several groups investigating the effects of unilateral lesions in the basal ganglia and motor systems of the brain because it is sensitive to the effects of drugs and grafts. The early Montoya papers (1990, 1991) used a design that was homemade and was subsequently changed. The revised model, which is the basis of the Model 80300 was first used by Abrous et al 1993a,b and is detailed in Abrous et al 1994. The essential difference is the early one was a very small chamber in which the rat could not move at all. the task remains the same. References to the Abrous papers are available in the DOWNLOADS area.